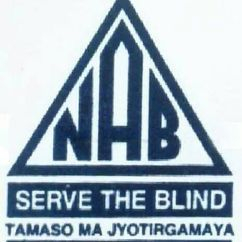 The National Association for the Blind-Goa is a branch of the National Association for the Blind (NAB-India), an organisation that grew out of the desire of Mr Mangulal Jethalal Shah, in 1947, to elevate the disadvantaged position of the blind in India in terms of education and skill development so that they would become independent and self-sufficient in their own right. The idea of NAB (India) took concrete shape in January 1952, when Mr B G Kher, the erstwhile premier of Bombay Province, moved a resolution at the First All India Conference for the Blind held in Mumbai. Barrister Rustom Merwanji Alpaiwalla was the first president of NAB (India), leading an executive council of 19 members. With the motto Serve the Blind, NAB (India) has lead the way for employment placements for visually impaired people in India. The triangular logo stands for the relationship between the state, the voluntary agencies and the blind. The Sanskrit phrase Tamaso Ma Jyotirgamaya on the logo denotes ‘Lead me from Darkness to Light’. NAB has had the privilege of having Helen Keller lay the foundation stone for its Workshop for the Blind. The organisation introduced the white cane to India as well integrated education to include visually impaired children in regular schools. The Goa branch of NAB was established in February 1983 by the late Mrs Marion de Souza. This compassionate entrepreneur was also the Association’s founder president. Mr Rozendo Mendonsa is the present president. The NAB headquarters are located at Santa Cruz, Panjim, and about 2000 visually impaired people have benefitted from the organisation’s efforts. NAB is focused on its programme of Integrated Education, wherein partially and completely blind students are mentored by special educators using Braille, tactile maps and diagrams while low vision students are given textual information in larger print and magnifying glasses. They are coached to enable them to join mainstream schools and colleges as part of inclusive education. The Multi-Handicapped Project introduced in June 2004 is a boon to visually impaired children who have other disabilities too. These students have a special education teacher, Sejal Sanjay Parab, to tutor them. The teacher makes home visits and sensitises the parents as to how they should approach the rearing of differently abled children. With certain students, Sejal focuses on developing fine and gross motor skills and teaching them to communicate and socialise during her home visits. Using the JAWS (Job Access With Speech) screen reader software that either reads text on the computer or provides refreshable braille display with braille characters that can be read by visually impaired persons, computer training is provided to students as well as adults, where they can work from computer basics to programming. The visually impaired students are taught music (tabla, keyboard, etc), and there are some who have been trained in theatre. Not allowing their disability to deter them, students have taken part in cricket, chess and athletics. In fact, NAB-Goa can boast of a student having won a gold medal at the National Abilympics (Abilympics, held at national and international levels, has competitions involving vocational activities to showcase the abilities of differently abled persons) for waste reuse. The organisation also has a bronze medallist at the International Abilympics. The students receive training in yoga and judo from professionals. 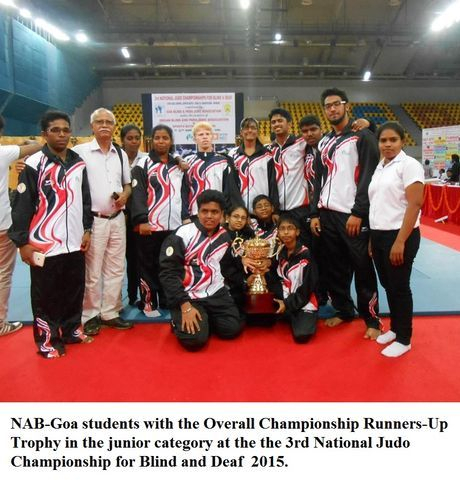 The children of NAB-Goa were part of the Goa team participating at the 3rd National Judo Championship for Blind and Deaf organised by the Goa Blind and Para Judo Association at Mapusa, Goa, in 2015 and they won the Overall Championship Runners-Up Trophy in the junior category. Among the teachers at NAB, Tanuja Zalmi, Bharti Gauns, Leena Prabhu, Celina Fernandes, Pradip Gawade, and Tessy Gomes teach mainstream scholastic subjects. Mahadev Sawant imparts training in computers and mobile operation while classical music is taught by Sumalatha Marabe. 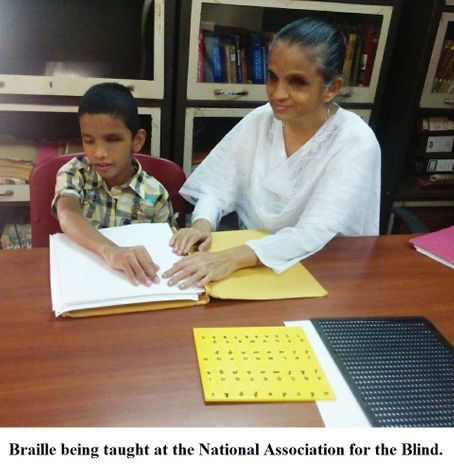 Josephine D’souza’s concentration is Braille and Gayatri Konkar is the counsellor. Volunteer teachers include Saraswati Sardar, Usha Kamat, Sonali Kulkarni, Juhi Prasad (yoga), and Dr Christo Fernandes (music). 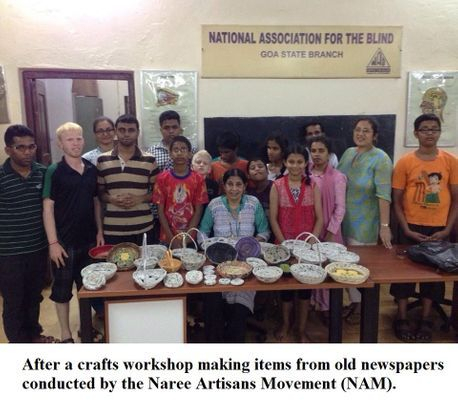 NAB-Goa organises camps for visually impaired adults to learn vocational trades such as making paper bags, candles, and chalk, re-caning of chairs, etc, so that they can earn their own livelihood. Arrangements are made for partially or completely blind persons to undergo training in telephone operating, stenography, physiotherapy, farming and computers as well. The children participate in dance, fancy dress, quiz, debate, singing, etc competitions, which encourages them to explore their talents. Excursions, picnics and the celebration of various festivals bring a sense of normality to their lives. It helps the children broaden their scope of thought and principles and makes them braver in their life choices. Recently, in February 2018, the children had a fruitful trip to the Dr Salim Ali Bird Sanctuary, guided by architect Tallulah D’Silva of Mission Green Goa. They were able to absorb the scents and sounds in the environs, and the textures and shapes of the flora and fauna they came upon, thanks to their heightened olfactory, auditory and tactile senses. The 30 students are housed at the NAB headquarters and can avail of free boarding facilities. However, the expenses are met entirely through donations, which in present times do not cover the monthly expenditure of Rs 5 lakhs for books and stationery, school fees, food, provisions, toiletries, and salaries of the teachers and other NAB staff. Willing donors are invited to make a donation of Rs 1000/- per month to help a blind child study in a regular school, be fed and clothed, and obtain tutoring from a Braille-trained teacher. Please contact 9326101326 - Deepak Prabhudesai, or 9822100498 - Rozendo Mendonsa, for any other information required. All contributions are eligible for 80G income tax exemption. Looking forward to your valuable support for the blind. *All photographs have been taken from the NAB-Goa Facebook page. You can join the NAB-Goa Facebook group and like the Facebook page to show support for the NGO's work and stay updated.